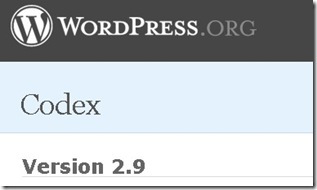 WordPress 2.9 is coming soon and it’s time to see what we can expect from this release. WordPress is one of the most popular blogging platforms and is available in a hosted version at WordPress.com and as a free self-hosting version at WordPress.org. WordPress 2.9 is the next version in the recent updates and I am pretty excited for a few of the features in the release. But, it is not as exciting as the huge changes in WordPress 2.7 but again that’s why it is a release update and not a version upgrade to 3 yet. But there is still a slew of new features in this release and let’s take a look at some of them. Comment metadata – This basically means you (or a plugin) can do cool things with your comments data such as displaying popular comments, etc. Plugin/Theme Editor Enhancement – Your scroll position is saved in plugin and theme editor which means no more trying to find the line you just edited! As you can see, as usual this WordPress update has a nice set of new features. I know some of us love frequent updates and new features and some of us hate it as it means frequent website updates. Automatic upgrade introduced lately has been a great help for many (as long as you make a database and file system backup beforehand) and I have hardly seen any upgrade failure in the many WordPress upgrades my wife has been doing for her clients. Although it needs my attention now with many new plugins I use, Top WordPress Plugins has been the most popular article in ShanKrila and I hope you will enjoy it too. Doesn’t WP already allow the [gallery] shortcode? Is it different somehow? .-= Andrea_R´s last blog ..WordCamp New York =-. Nice roundup! I should use them when I move to WordPress. .-= Phaoloo´s last blog ..8 Free Tools To Recover Your Lost Password Stored In Popular Applications =-.